Hey. 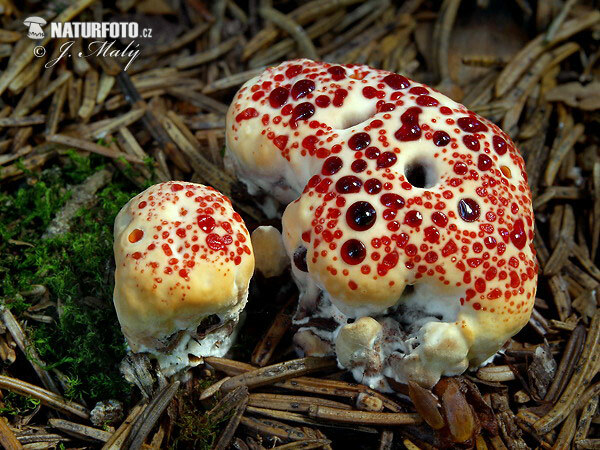 Where’d you get that fungus? « Nothing in Biology Makes Sense! Hey. 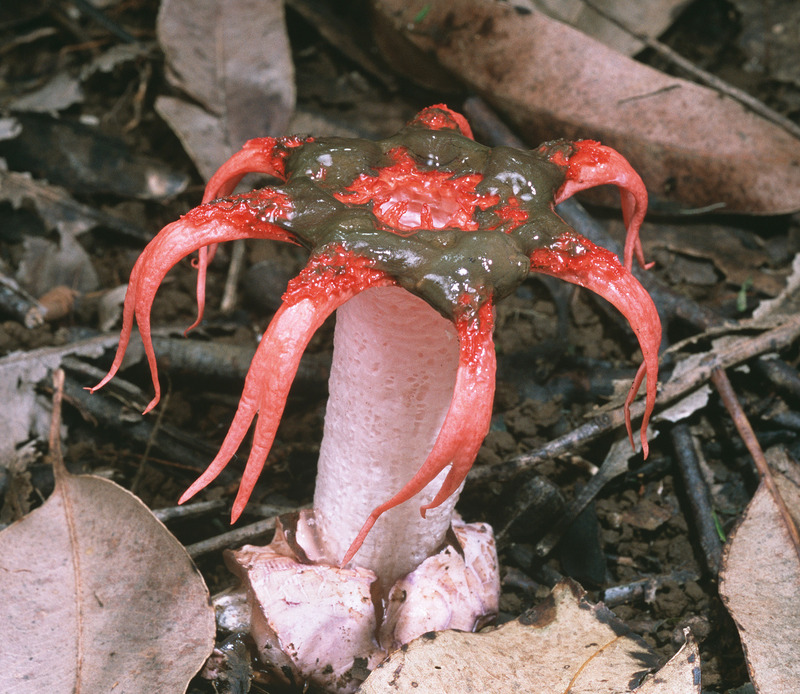 Where’d you get that fungus? Fungi are pretty. And the ones in your home are (hopefully) smaller than this. I’m very excited to be going to this meeting in June that focuses on the microbiome (i.e., all the living microbes) of our built environment – our homes, work places, sewers, etc. I’m used to thinking about the genetics of much larger living things – like chipmunks – where large non-living things – like rivers – create barriers between populations within a species which allows the populations to evolve independently. It’s been surprisingly difficult for me to apply my background “macro” knowledge to my new “micro” interests. How do different microbial species arise? What is a microbial species, anyway? Specifically restricting my many questions to our homes – what barriers could cause divergence between seemingly connected individuals? Bacteria abound on our skin and when we come in contact with items in our home, our bacteria are directly transmitted to the surface (think door knobs). Additionally, we shed skin cells – and their bacteria – in our homes resulting in a near constant snow of human-associated (and pet!) bacteria. These facts lead to human occupancy being a source of our indoor microbiome. But bacteria are not the only miniscule things sharing our living spaces. What about other microbes? And now for the question of the day: where does the fungi in your house comes from? RESULTS! To gloss over a lot of cool details – Adams et al. found basically no evidence that we, the inhabitants, affect airborne fungi. They also found no evidence that similar rooms across apartments bear similar fungal communities (basically, bathroom fungi from one person’s house is not the same as bathroom fungi from another person’s house). So what DOES affect fungi? 1. Season. 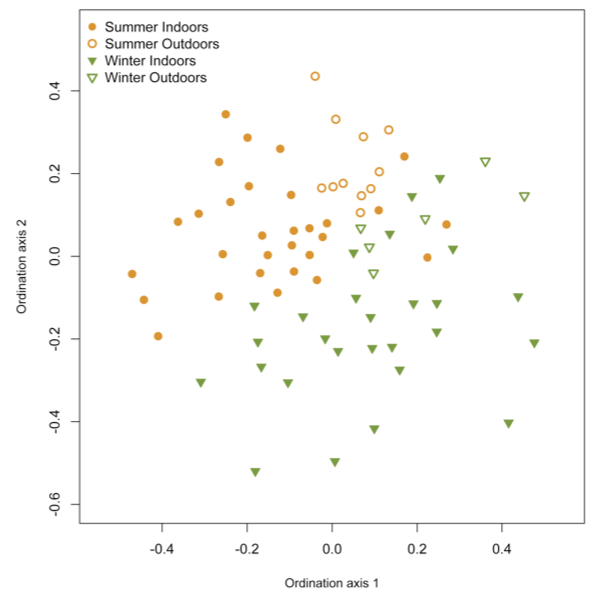 Both indoor and outdoor fungal communities show clustering by whether they were from the summer or winter (Figure 1). Winter samples contained more types of fungi and the authors note this is probably due to a climate that results in more winter sporulation. 2. Randomness. Indoor fungal communities were random subsets of the outdoor fungal communities and each apartment was basically distinct. 3. Distance. Units that were closer together had more similar fungal communities. This pattern of “isolation-by-distance” is a well-known and beloved observation/process in macro-biology and has been shown in microbes at large distances, but this study shows it on a very small scale (<500m). The authors conclude that this observed pattern is because fungi are limited in their dispersal ability, i.e., closer buildings have more similar fungal communities because they are closer to the same fungi, which can’t reach all buildings with equal ease. Important caveat: observed isolation-by-distance is not always due to dispersal limitation. If an important environmental variable is also linked to distance, it could be that variable that is causing more physically distant communities to appear more compositionally different. However, the authors attempted to control for these effects by using buildings that belonged to a single housing unit, made of similar materials and located in close proximity – so the conclusion that it actually is dispersal limitation that is causing the pattern is quite reasonable. This study is cool to me for a lot of reasons. First, by talking about microbial ecology in terms of dispersal limitation and isolation-by-distance, it helped me get my head around some things and into the micro game. Second, it was very easy to read and I recommend doing that if you’re interested (it’s open access!). Third, I’d never thought about where my home’s fungus comes from and I love that technological advances are facilitating the asking and answering of these types of questions. Hooray for fungal research. Adams, R., Miletto, M., Taylor, J. & Bruns, T. 2013. Dispersal in microbes: fungi in indoor air are dominated by outdoor air and show dispersal limitation at short distances. The ISME Journal. This entry was posted in metagenomics, microbiology and tagged dispersal, fungi, isolation-by-distance.